Michelle ~ “I guess this would go for both Monday and Saturday. I have mentioned before that I collect (maybe USED to collect??) vintage brooches. I have somewhere along the lines of 75-90 regular ones and then about 45 Christmas brooches. Yesterday I pulled out all of them and emotionally distanced myself from them. I quickly handled each one and the questions were, do I like this? Do I wear this? 5 were gifts from gal friends and 8 were gifts from my mom. Only 1 had I bought. Of the Christmas pins, 8 of them I decided need to go. That’s 22 pins. Good grief. I also tossed in two vintage necklaces. What I got from this exercise is that if we put away the emotions, the decision becomes so much easier. There was a really neat result from this: Now when I look in my jewelry box, I love everything I see. I don’t get frustrated pawing through the junk to get to the good. It’s all good. And quicker to get ready. This could be true for the closet too. If you love everything in there, then the frustration goes away. It never ceases to amaze me how many ways there are of saying the same thing and Michelle achieved that with her comment ~ “…if we put away the emotions, the decision becomes so much easier.” and it is so true. Focus on the desire to minimise your possessions and don’t allow emotions of silly sentiment, obligation and aspiration get in your way and you will soon find that there are many things you are keeping that you have no love or need for. Let these things go and you will find space opening up all around your home. Michelle followed her comment up with more detail. You can read it here. Declutter something left in your home by someone else. Cooking oats for breakfast soak them in water overnight. This will cut down on the cooking time thus saving power. Thanks for running with this, Colleen. 🙂 I again set my emotions aside and finally decluttered a hand mirror that a best gal friend from ages ago gave me. It has been sitting in a box unused for years. I have a few other things that my friend gave me. I don’t need to keep the mirror. Into the donation box that goes!! Your are really making great headway on the sentimental stuff with this attitude Michelle. Well done. And thank for the post inspiration. You must look at your new brooch section of your jewelry box/armoire/storage with such delight now that it houses only those brooches that you love. My guess is that soon you will be tackling all other areas of your jewelry as well. Wow! Great idea to just ignore or set aside the emotions. I’m trying to do this myself and am getting better. This last weekend while helping my parents put away their books in their new built-in bookshelf, I kept reminding them, “Let’s only put books in here that you have read and love or will read again.” I finally got my mom to get rid of a few, but not before she asked us all, “Is it ok if I get rid of this? So and so gave it to me, but I don’t really want it.” I kept reminding her that it didn’t matter who gave it to her, it only mattered if she liked it or would ACTUALLY use it. Kayla, I’m glad you were able to help your mom see that there is no obligation to keep something that was a gift. Kayla – that’s great. Sometimes getting ‘permission’ from someone else is a good place to start. In working with my parents to downsize their household items, I realize the Declutter Education we have all received simply by reading with Colleen for awhile. We know the questions to ask and criteria to help our loved ones figure out how to let things go. Vicki K – yup, we’ve heard it all before and we can see all the holes on the arguments. Thank you Vicki K, it warms my heart to know that the effect I have with my community here is spreading to ever enlarging circles. Well done Kayla, you are being a great example for and influence on your mom. Well done you. 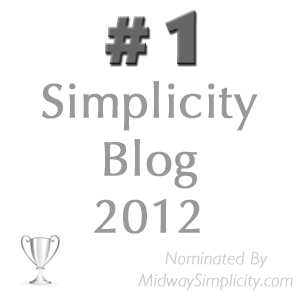 I was just a saying to Andréia the other day what a ripple effect my blog has. She was saying how she has influenced her husband as well as her Godmother. Now if those two people had an influence on a person they know and so on and so on we may change this consumeristic world after all. The good old butterfly effect in motion, I love it! I am very pleased to hear that Kayla and I wish you all some very happy decluttering and homes you feel content in. Colleen & Michelle, the emotions will get us every time. I have very little good emotional attachment to anything. I have found that I mostly have had obligation guilt. I’m glad I no longer have that. Deb J – several years ago we were given several hours warning to evacuate. We ran around like headless chickens finding things and loaded heaps and heaps of stuff into the car and headed off. Fortunately nothing came of it. Now if I had to evacuate I would have a much much simpler time of it, yay for digitising and simpler living. Moni, I understand what you mean. I too love the simplified life. Other than the books I decluttered a long time ago and the scrapbook stuff I decluttered over the past 2 years I have had very little that was in need of deluttering. I have tended to live pretty decluttered. For instance, my bedroom has a bed and a chair. I don’t need a dresser and anything that needs to go in a drawer fits in a drawer in the bathroom. I like that my walls have nothing on them. My bedroom is quiet, clean, uncluttered and peaceful. Mom’s room has a bed with all sorts of things to put on it, a 6 drawer dresser that is loaded with stuff she seldom looks at, has stuff on top and the walls are well endowed with pictures and stuff. She also has two large closets full of stuff. Her bathroom has two closets that are also full of stuff. It’s all neatly organized but we don’t really need it. That’s the difference between the two of us. It’s been an interesting 21 years living together since my father died. Good for you Deb J, it sure makes letting go much easier. Lets hope your mom keeps coming around to your way of thinking. Just got motivated to get rid of two books that were sentimental. I cut the inscription pages out of both of them and put them in the donate box. Phew, still more of the same here but I’m working on it! Well done you Claire and keep at it. It becomes easier and easier. Thanks Colleen! I found another sentimental item to donate. It is a very pretty picnic basket complete with dishes, glasses, cutlery, corkscrew, and a small cutting board. My husband gave it to me 12 years ago……..it is so pretty we never used it! The tag is still attached. Also, I don’t think we ever picnic. I guess if we haven’t used it by now we probably never will. This week I have noticed my collection of House magazines in the bottom of the book case. I noticed them because there was a thin layer of dust on top of them. I have never associated emotions with my attachment to these magazines. I used to grab a couple and read through them occasionally. I would say it has been a few years since I even did that. Would I take them with me if I lived in a small Winnebago? Would the hall way be a better place without this dust laden bookcase? What else is on the shelves that is just collecting dust? It’s not the emotion of attachment that is stopping me from acting. I have lived without a second glance at these books for a while. I would never replace them if they were destroyed . The only conclusion I have is ownership. I own these books, they are mine. I would defend them if someone suggested I got rid of them. Wendyf – I think you have hit the nail on the head, sometimes it ‘ownership’ that is the defining thing that nails the item to the shelf or the wall or ??? – I used to feel very strongly also about a set of Home magazines that I had, then one day I found the ideas in them a “bit last year” (although they were about 2-3 years old by then) and when I visualised my dream home post-decluttering, none of the homes in the magazine actually looked like my dream home. So I sent them off to the local kindergarten who were very grateful. But yes, ownership is a powerful attachment. Hi Wendy and Moni, it sounds like a case of I might want them someday. When it comes to information in magazines I have found that one remembers the info is there but has to leaf through the whole pile to find it. It is much quicker and simpler to Google any information you want. Hence why I got rid of all mine and never buy them any more. I believe it was William Morris who said something like, have nothing in your home that is not either beautiful or useful. Each time we let go of the things in our lives that are currently not useful (to us) or beautiful (to us), we are left with wonderful treasures that speak to who we are at this very moment in time. I have left a trail of “Been there, Done that” items over my many years. Gone are the physical reminders, but they are never gone from my memory. I just don’t want my past to bog down my present or my future. Well said Kimberley, very well said. I just wanted to give you an update on my situation. This september I’m moving and I’m already thinking about how to decorate my new studio. I downloaded a list of household items that is suggested for my situation and I was shocked by the amount of items that are suggested. Luckily after years of decluttering I know better. I’ve already arranged a bed and a bureau (perhaps even a fridge). I see what I need more by just living. Hi Dymphy, thanks for the update. I am not surprised you encounter such a large list, no doubt the site was sponsored by many of the producers of such products. Good luck with your new home. And I love your decision about discovering what you truly need by living there. Start our with the essentials and figure it out as you go along. I finally did it! I recognized how much scrapbooking I was realistically doing to do and got rid of the excess materials. I will strive to continue to maintain my supplies according to who I actually am rather than this crazy notion of the ultimate scrapbooker. Feels so freeing! Good for you Claire. And don’t try to maintain your supplies try to minimise them as much as possible. Only shop for a current project while only keep supplies of items you use on every page. Such as adhesives etc. Hi Colleen – What a subtle but powerful difference to my previous supply approach. Thank you for everything you do. My house is slowly gaining breathing room as I mindfully declutter a little bit everyday.